Wind: Slightly from the southeast most of the day. Temperature: About 100+ most of the day. The weather was clear, hot, and lift could be found almost anywhere around the field but especially west-northwest of the IP. There was just one demo flight and a few private ships launched but the day was slow and the weather made pilots feel just a bit lazy. First flight of the day belongs to Roman Franco whose last training flight was April 11th, this year. So with that long a layoff, the first flight was expected to be in less control than he has demonstrated in the past. It was a bit difficult both on tow and off, but his second flight was so much better, it surprised me. His skill set returned quickly and if he continues to come out on a regular basis you can be sure he'll solo in no time. Roman Franco ready for his refresher flight after a four month layoff. A quiet day at Avenal with very few launches or training flights. Roman heading to the IP for his landing pattern for runway 13. 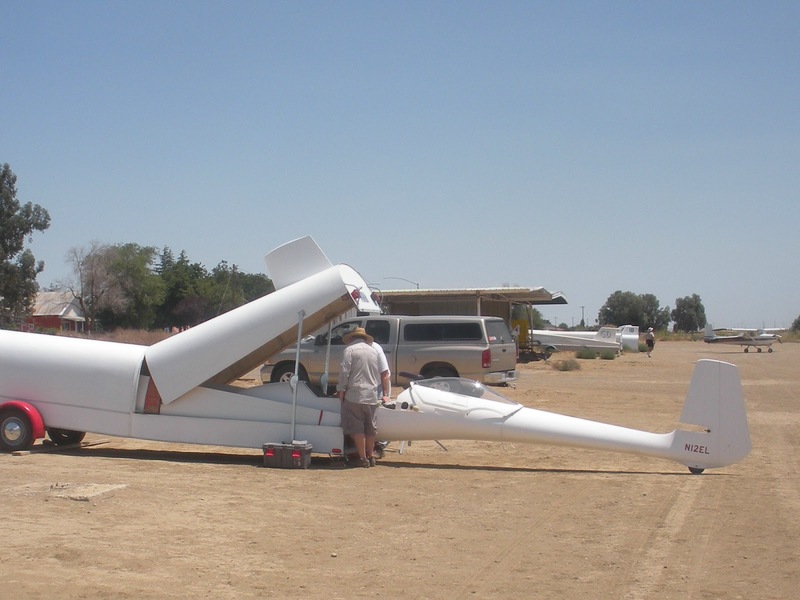 Mike Paoli and his son drove to Bend, Oregon, and purchased a Libelle. It looks to be in beautiful condition with all sorts of clever additions to the storage mechanisms inside the trailer. As best as I could see, the condition of the wings and the fuselage was excellent and Mike should have a lot of fun flying it. He had Martin Caskey look it over but Mike did not plan on flying it today. That's probably going to be next week sometime. We've had a number of Libelle's on the field over the years and all the owners have enjoyed flying that nice, docile but good performing glider. 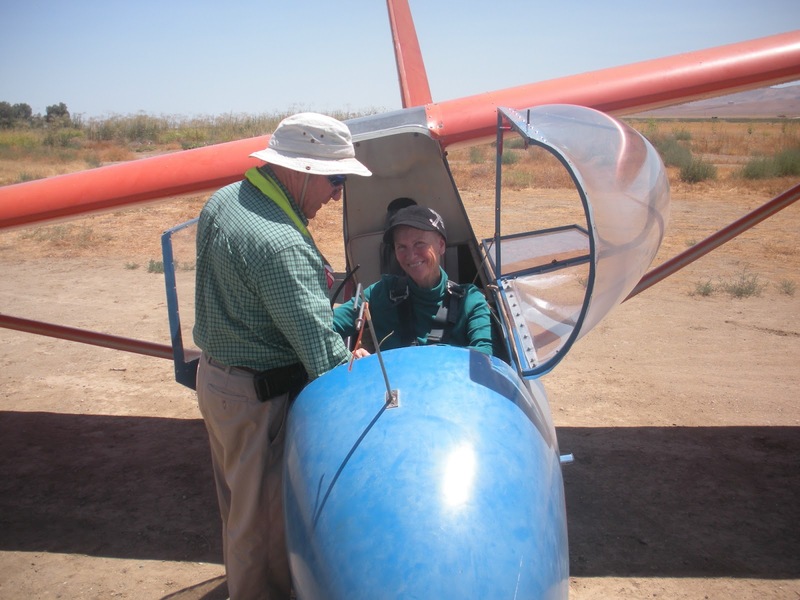 Mike Paoli and Martin Caskey examine Mike's newly purchased Libelle. Sergio Grajeda came out again this weekend for his third training flight. 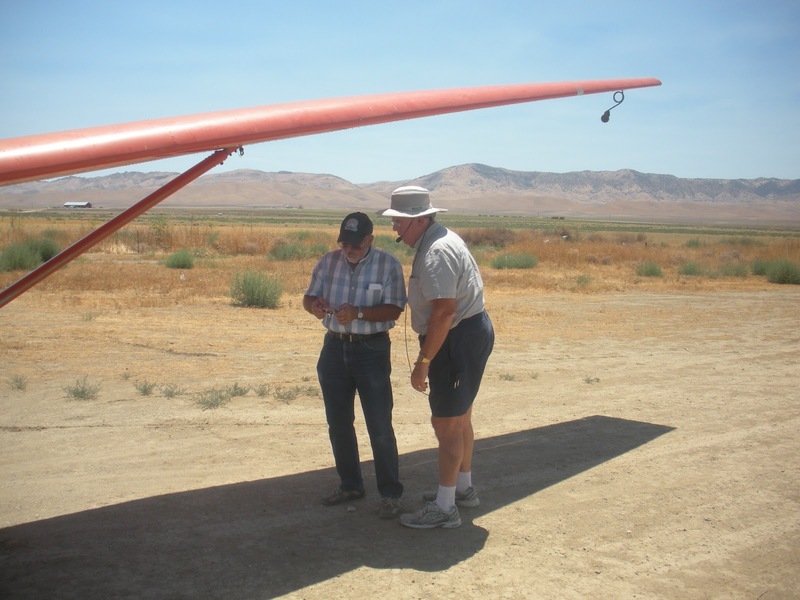 Sergio is one of the few Avenal residents who have taken an interest in soaring. The first was Matt Demsky who came out just to watch, then started helping, then began taking lessons, then soloed. In the interim we've had a few who showed some interest in soaring but had difficulty affording even the lowest cost to them. Perhaps now Sergio will take the training all the way to his license and represent Avenal well. 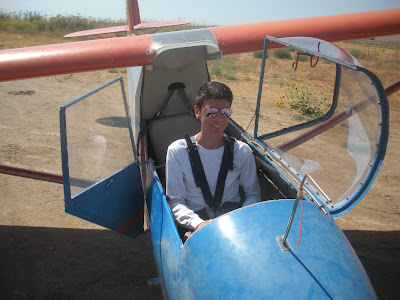 Later on in the day, Sergio wanted to fly again so I arranged for him to fly with Alex. 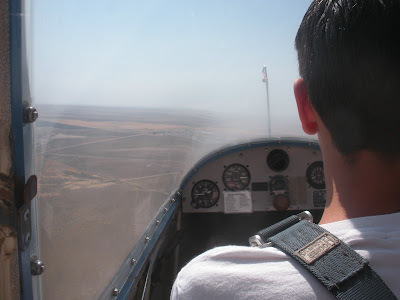 It's good for students to fly with different instructors once in awhile just to see how each explains and trains the student. It's really important for the student and the instructor to be "in sync" with one another and if the first instructor doesn't sync well with the student, he/she should try another instructor. Since we have three CFIG's on the field, the student has a reasonable choice. A couple from Fresno, Joachim and Carrollann, arrived about 11:00 am and waited a bit before heading off into town for some lunch. They came back again, and were scheduled to fly at 1:00 pm with Alex. When he arrived they all headed towards the launch line and went through the necessary preparations for flight. While I wasn't present when they landed, my guess is that she really enjoyed the flight. 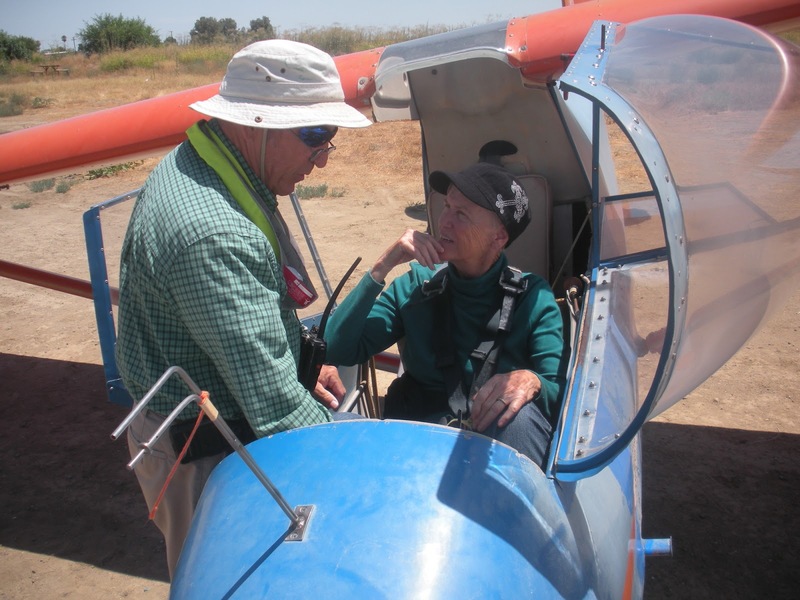 Carrollann waited patiently for Alex to arrive, then had fun flying a glider for the first time. Joachim and Jim Rickey check something on the cell phone before Carrollann's flight. Alex is giving Carrollann detailed instructions on how to fly the glider using stick and rudder. The day probably ended early although Joe Anastasio was still flying when I left at 3:00 pm. He was in the air several hours by that time so he must have enjoyed the flight. If he sends me his notes I"ll include them in an update to this story. 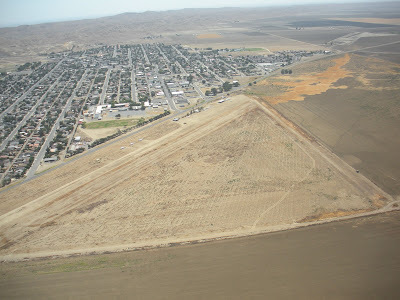 Saturday I flew for an hour, got to 4700 msl over the foothills. For some reason the heat was really bugging me, so I came in. It was rather warm at altitude, 75 to 80 deg.